Transwheel is a cool robotic design concept that is a combination of the delivery man and the delivery vehicle. It would use GPS to navigate between locations and facial recognition software to confirm the identity of recipients. 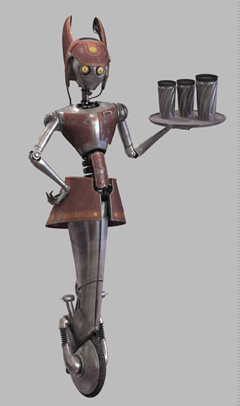 Speaking of single-wheel delivery concepts, Star Wars fans of course remember the waitress robot WA-7, the friendly robotic waitress from Dex's Diner in Star Wars II Attack of the Clones.